This is one of THE BEST pi guides I have ever read. Well played Sir. Thanks for the amazing guide! I have been searching all over the web for a guide like this one! Hello, I'm using Raspberrypi3-b and I have downloaded the NOOBS myself and installed Raspbian Jessie Lite by mistake because I wanted to have the desktop environment in the first place. So I did my research and I came up with this Guide. I followed all the instructions and I did installed PIXEL; after 30 minutes of installation, I'm still back in the command prompt. What can be wrong? can somebody help me get in a desktop environment? Please. Daisy101 wrote: Hello, I'm using Raspberrypi3-b and I have downloaded the NOOBS myself and installed Raspbian Jessie Lite by mistake because I wanted to have the desktop environment in the first place. So I did my research and I came up with this Guide. I followed all the instructions and I did installed PIXEL; after 30 minutes of installation, I'm still back in the command prompt. I mean you can always reformat your SD card and start over. In terms of Raspbian Lite with GUI, the steps listed should work fine. I *LOVE* the XFCE interface as you show it in the screenshots. Any chance you could point me to where I can make mine look the same? Thanks, this is very interesting. I have tried it and I must say this procedure is in no way quicker than installing the full Raspbian image then removing the packages I don't want. FloatingCloud wrote: Thanks, this is very interesting. I have tried it and I must say this procedure is in no way quicker than installing the full Raspbian image then removing the packages I don't want. Removing packages from full Raspbian kind of defeats its purpose. You're better off starting clean. Some packages will not be removed completely anyways. And the fact that you can take it a step further and install only the bare components. But again depends on scenario and the person. Firstly fantastic guide, I saw some negative comments along the lines of what’s the point, but IMO it’s a great way to learnt how the OS works and is put together, well done !!! I had a bit of a head scratcher after installing MATE, applications like Synaptic or GParted when started from the menu would ask for user “root” and not authenticate. I’m not sure if this was an issue caused by me but it stumped me for a while. On my build this was missing..
Reboot and you are good to go ! One more for MATE, if you want to edit the system menus you need the mozo package..
i installed raspbian lite and pixel. This tutorial works great. If now come an offical update for pixel, do i get the same update like the offical version from raspbian or do i need a special update for this version? The german translation is very bad, is there an update or location file to fix this? You will get the same updates. then sudo apt-get update && sudo apt-get install piclone should run OK.
Hello, i found a bug. If i do rightclick on a file, i can choose "open with". There i saw the old Programms like games - minecraft, development tools and more. Hi, What archive extractor did you use? how to setup wifi like Pixel's way? How do I install the add and remove programs setting that lets you find and install programs? In Rasbian Lite, anything you see in full Rasbian can be installed to your installation of Rasbian Lite. You just need to figure out the name of that "package", meaning that each application is associated with a package name. Problem is that I don't know what the package name for that installer is since I don't use full rasbian. If you followed the guide and used this: sudo apt-get install --no-install-recommends raspberrypi-ui-mods. Then you will end up in a login screen loop. It seems that since stretch update, it requires recommended packages too. 1. At login screen, press ctrl + alt + F6 to get into terminal. 2. Log in with pi / raspberry. 3. Type: sudo apt-get remove raspberrypi-ui-mods. 4. Type: sudo apt-get install raspberrypi-ui-mods. startx would just dump out with missing dependencies and I was not sure which package was the culprit. I'm guessing pimixer didn't have anything to do with it but while zeroing in on the packages it was in the mix. Install these, reboot, and you should be to the desktop. The pi-greeter and pipanel packages definitely seemed to be related, although if the packages are later removed the problem does not resurface. So maybe something that gets configured as a process of their install? I am on Stretch lite. from my Mac. Let’s assume, I want to install PIXEL or something lighter if there is. What are the minimal packages I need to install to remotely run the GUI? For instance, I do not need any login manager. Do these packages to be install always run in the background or only when I run the GUI? In other words, do they consume resources only when the GUI is in use or always? I'm not understanding. If you use X11 Forwarding, you don't need a GUI. 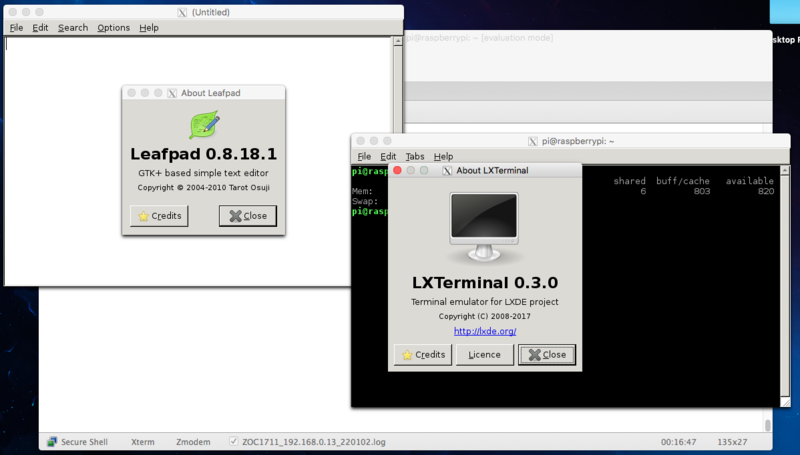 You just need to install the apps that you need on Raspbian Lite and just run them from your Mac terminal. If you want to run multiple windows, you just type in "nameofapp &" in terminal.